Looking for a way to engage your students in equivalent fractions? 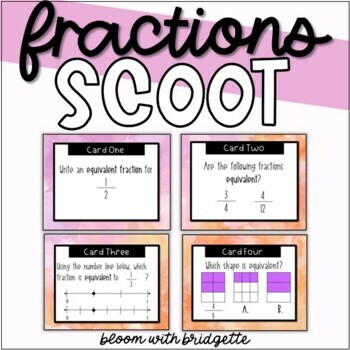 This watercolor themed equivalent fraction scoot will get your students moving around the room, discussing math with each other, and practicing identifying equivalent fractions. Use these pretty cards as a scavenger hunt, scoot around the classroom, or as station task cards. Included in this product are 28 equivalent fraction cards, a key, and two different student recording sheets.